Disclaimer I was given products in this post for the purpose of review. I was not paid to write this review. Stop what you are doing right now!! You may think you are done Christmas shopping, but The Simple Me Blog has 2 more gifts to share with you. The first one is the all new LEGO NINJAGO MOVIE! My kids LOVED it!! Not only did they giggle the entire movie, but after words the acted out some of the scenes and were pretending to be the Ninjas from the movie. 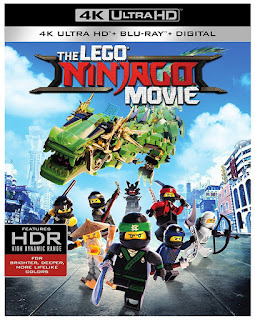 So from the description you can see it is a group of young Ninjas who have to take on the big bad WarLord Garmadon. He is Lloyd's dad, and most of the people who know Lloyd are just waiting for him to turn bad like this dad. IN an attempt to win everyone favor Lloyd tries to be a hero, but it all goes horrible wrong. To try and undo what he did he must travel with his friends to the hidden temple. There is a lot of cool action scenes, the jokes are funny and even the music is catchy!